This map isn’t as pretty as the Xenoworld one (in my opinion) but I thought I’d share it just in case you were interested. The Novan Empire is only alluded to so far in the series, and I hope to incorporate it into the series in later books, because it’s formation/influence on events and history is very instrumental. As might be guessed, The Novan Empire is the spiritual successor to Emperor Augustus’s Nova Roman Empire in The Wasteland Chronicles. It is not the same empire, but rather the third empire to bear the name (the second existed around the time of Hyperborea). The biggest thing you might notice is that it is quite large, especially in relation to Colonia in the north (which is just a tiny area comprising southern Arizona for the most part). As such, it’s the big dog and major regional player. All the other countries (Itza, Kichea, Coconia, Totonac and Baja California — are all client states of the Novan Empire, sort of like vassals, which means its holdings comprise most of modern day Mexico. These names are also throwbacks to the names of Pre-Colombian Mesoamerican countries). The region, beginning in 2400 or so, was more highly fractured, as Mexico was not immune to the Mindless Wars that occurred roughly 2315-2390 A.D, and it was only in 2459, the date Xenoworld begins, that is exists in this more united state. 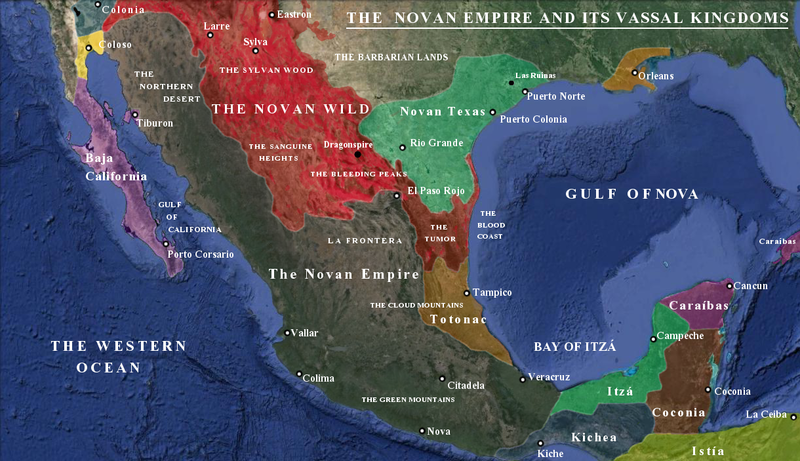 Over the decades, the Novan Empire, through a series of conquests, took control of most of Mexico. The only other rival power is Caraibas, which is a colony of Brasilia — another major player controlling much of South America that hasn’t yet been introduced. The two sides have warred on and off over the centuries. Istia is also a client state of Brasilia, effectively serving as a buffer between north and south. Brasilia is one reason why Colonia or Coloso have not been conquered, because Nova does not want to risk a Brasilian incursions to the south if it sends its armies north. Novan culture is mostly Mexican in nature with heavy Brazilian influences, as Augustus’s Empire was conquered by Brasilia in about 2180 (I’m still working out some of the details of the timeline, hence why some of the city names are more Portuguese in nature (including Caraibas, which is Portuguese for Caribbean, and Citadela). However, there was a revolutions that formed the Second Empire within a generation of the conquest (which again fell during the chaos of the Mindless Wars). In recent years, The Novan Empire has established its own colony beyond the Red Wild, called Texas (it made sense to me that they would use its historical name instead of making up something completely new). Colonies were founded on the sites of what used to be Corpus Christi and Galveston, and Nova hopes to use this area as a springboard to influence the Eastern Kingdoms in the future. The Novan Wild cuts the country almost in half, and is only passable in one area. There have been skirmishes between the Novans and the Makai, the only one of the Three Tribes that lives in the Novan Wild. Though the Makai are greatly outnumbered, the Red Wild protects them, and they fly dragons, which are a huge advantage, so the Novans mostly leave them alone except in isolated cases. The Novan Wild is much “wilder” than most of the other parts of the Red Wild, featuring lots of mountains and thick forests, making it heavily populated with dragons, who as a rule, don’t much associate with humanity, even if they are Elekai. Orleans has retained its name (at least in this version). It is one of the Eastern Kingdoms, of which I hope to do a map someday (though the sheer amount of kingdoms will make that task quite tricky). Another thing: “The Tumor” is the only major reversion to be so far south. It is an incredibly dangerous area, which makes passing it only possible with great force of arms, and even sailing around it is dangerous, as Mindless dragons will attack lone ships sailing north and south within range of the land (most ships use the power of the wind in Xenoworld, as steam power has not been rediscovered in most areas). It’s coming along, folks. Isaru and Shanti are making a very long and often uphill journey to get to Hyperborea and it feels as if I’m doing the exact same thing with the manuscript. The first draft is halfway done. One of the reasons it’s taking a bit longer is because I had to delete a lot of stuff that was going the wrong direction. I do have the rest outlined and am happy with the new direction, so it’s just a matter of writing out the scenes, so things should be going a lot faster, now. I do think this one has the potential to be the best one thus far. Lots of action and twists, and stuff readers tend to like. I still don’t have a title, but I think a good one will come to me soon. No cover yet as well, but that’s mostly because I’ve been unable to find a good image, and it helps to know the title to make the image make sense. But enough of that malarkey. Just thought I’d send out an update to let you know it’s in the works. No firm release date, but it should be about a couple of months if I had to guess.